The subject of National Review’s Corner came up today in an e-mail exchange. I mentioned that I’ve stopped reading it pretty generally. This was a sad departure for me. Ever since 9/11, the Corner was my favorite online hangout. Intelligent conversation from smart, well-informed people who knew a lot of stuff. What could be better? I even e-mailed the columnists and got replies once or twice. And one time Jonah Goldberg posted a Norwegian translation I did for him. But the grape has raisined. Nowadays, you go to the Corner to get a good depression on, as an excuse for binge drinking. First I started being irritated with John Derbyshire’s knee-jerk pessimism and Anglican-tinged lukewarm religion, blended with fervent scientism. Then Heather MacDonald started coming in to attack theism. And Jonah Goldberg doesn’t seem to show up much anymore. And when he does he’s not as funny. And they’ve all decided the war is lost. If I want dysphoria I have a large stock of my own, thank you very much. Also a little depressing: an interview Dennis Prager did today. It was with Marianne Legato, professor of clinical medicine at Columbia University and author of Why Men Never Remember and Women Never Forget. Her theory is that men and women’s brains (in general) work very differently, and that in order to get along they need to take those differences into account. Overall, I like this thesis very much. Any defense of innate sexual differences is Gershwin to my ears. No problem there. The problem was in something she said about how men and women argue differently. Women, she said, play arguments over and over in their heads after it’s done, and tend to get angrier. Men, once they’ve blown off their steam, walk away and forget about it. They actually feel better, having enjoyed a nice spritz of adrenalin. Here’s my problem: I’m just like a woman in this. I don’t feel better after arguments. I obsess over what the other person said, and what I’m sure they meant, and what I should have said. Guys, help me out here! Is she right? Do you forget arguments as soon as they’re done? Do you in fact feel better afterwards? Tell me I’m not an utter wuss. Blast. Still a couple weeks until my next chance for live steel combat. And that’ll probably be the last one of the year. I do feel better after that kind of fight. Hit me with an axe, somebody. Summer has lost its edge. The days are kind. Strawberries taste like summer to me. I know a lot of people reserve that distinction for watermelon, but I never liked watermelon. I never liked raspberries either. One of the chief distinctions between my brother Moloch and me has always been that he likes raspberries while I like strawberries. Recent research indicates that people are born with different numbers of sweet or sour receptors on their tongues. If you have a lot of sweet receptors you’re sensitive to sweet, and will prefer sour. You’ll be a veggie eater. If you have a lot of sour receptors, on the other hand, you’ll prefer sweet. You’ll truly appreciate the wonders of the strawberry, and be forever barred from appreciating the virtues of its raspy cousin. I buy Driscoll’s, of course. Until they showed up, you had to grow your own to get anything in this country that could come close to the wonders of Norwegian strawberries. From Front Page Magazine, this review by David Forsmark of the new book Mayflower: A Story of Courage, Community and War. Here is one of Philbrick’s most valuable points: Despite the priggish image perpetrated by the scoffers — including the first revisionist, novelist Nathaniel Hawthorne — the Pilgrims were adaptable people willing to compromise in order to live in peace despite their strict code and religious outlook. Now that looks like a worthwhile read. I only watched Steve Irwin’s program once, and that was because I was visiting my dad and stepmother in Florida, watching what they watched. Their television consumption was limited, since she was uncomfortable with the immoral fare on television nowadays. But she didn’t object, apparently, to watching predators tear their prey limb from limb, and so they watched a lot of animal shows. Even when I had cable I never watched animal shows. Animals, to be blunt, bore me. I don’t hate them, and the idea of owning a dog has its charms, but animal programs just make me uncomfortable. When the lion hunts down the zebra, I identify with the zebra. When only one male seal out of a hundred gets to have a harem and reproduce himself, I identify with the ninety-nine. When the wolves turn on a wounded pack member, guess which wolf gets my sympathy? In other words, animals in general aren’t very nice. I prefer people. And I don’t even like people much. The main thing I remember about Irwin was that stunt a few years back when he held his baby son in one hand while feeding a croc with the other. That just gave me the heeby-jeebies. Still, I just read this report that says that his last action in life was to pull the stingray barb that killed him out of his heart. That’s style. That puts him in the Viking league. Then [the nurse-woman] took a large pair of tongs, and tried to pull out the iron; but it sat too fast, and would in no way come out, and as the wound was swelled, little of it stood out to lay hold of it. Now said Thormod, “Cut so deep in that thou canst get at the iron with the tongs, and give me the tongs and let me pull.” She did as he said…. Then Thormod took the tongs, and pulled the iron out; but on the iron there was a hook, at which there hung some morsels of flesh from the heart,—some white, some red. When he saw that, he said, “The king has fed us well. I am fat even at the heart-roots:” and so saying he leant back, and was dead. Romans 3:1-8 is a passage that’s always puzzled me. It’s not that I disagree with what’s said there, but Paul seems to be addressing First Century arguments that nobody would make today, and that confuses the contemporary reader. There are doubtless many deep truths in this passage that I’ve missed so far. That’s a given. But one point that struck me as I studied it today was that Paul is drawing a line here. He’s saying, “There is a difference between right and wrong. It’s not just a matter of point of view. It’s not variability in cultural values. God approves of some things and condemns others. He’s not broad-minded in the sense that’s fashionable today. There’s a tendency to think of “spiritual” as being the same thing as “fuzzy.” In the spiritual realm, we imagine, all differences are smoothed out. All disagreements are discovered to be meaningless. Right and wrong are seen as equally valid manifestations of the Eternal. Yahweh and Baal are really the same Being, as is Asherah. Paul says “Hooey.” God is just, and He has told us what He means by justice. Don’t imagine it’ll all even out in the end. Get with His program or suffer the consequences. Today was the first day of my week off from work. I took a walk for exercise, wrote a thousand words, and picked up a few needed items, including a rat trap. I don’t have rats, but I have chipmunks attempting to take up housekeeping in my garage. My instinct is to live and let live (perhaps charging a nominal rent), but people tell me chipmunks are prone to gnaw on your car’s wiring, so I’ve declared Total War. Three chipmunks have been liquidated to date, and I felt it was time for a new trap. 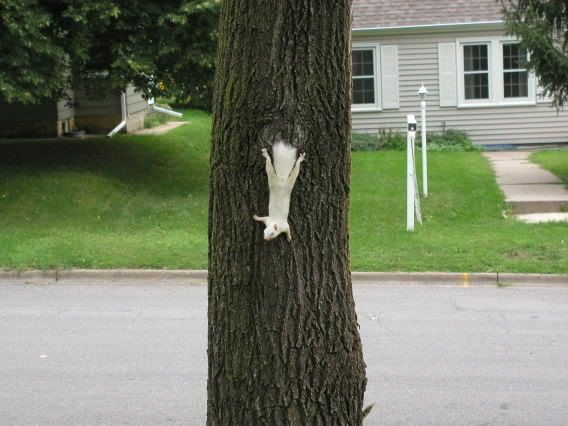 I have a higher regard for my white squirrel. One day last winter, shortly after I’d moved in, I was talking to my brother Moloch on the phone, and I saw an albino squirrel in the back yard. On Saturday I saw him again, in the front yard. Albinos are rare in the wild, being pretty easy targets for predators, but I suppose an urban environment provides better cover. I feel an affinity, for some strange reason, with any creature ill-designed for survival by nature. By way of Blue Crab Boulevard, some very nifty, downloadable inspirational posters based on the original Star Trek. I love this kind of swill.